The Lyrical Thyagaraja Blog - Tyagaraja Darshana (www.lyricaltyagaraja.com or LTB) deduces and presents the true message of Tyagaraja Swami. Each kriti (song) is treated as a step in this development and gives the sahityam (lyrics), an authentic verse translation and context from Indian literature, history & philosophy. Comparisons with western Classical Music, Philosophy and World Literature complete the picture. Will contain all 600+ kritis! Notation and manodharma (improv) content soon!! *MAJOR UPDATE #2 (2018): New songs, posts and other updates are now on this page. *MAJOR UPDATE #1 (2011): We invite you to use our dedicated domain names -: Readers can now find our site more easily through our two domains. www.nagumomu.in will take you straight to the "crucial" Nagumomu Ganaleni page and www.LyricalTyagaraja.com will bring you to the home page, that is here. Now, on with the regular transmission. Vijayadasami 2018: TENTH YEAR!! A HUGE Thank You! to all our readers as we "officially" start our tenth year: Details in the last two bullets below. Now, on with the regular transmission, for real. Here are many factors, features and considerations about this work. Feedback from readers: Due to our approach and extent of treatment, it can take most readers some time to read fully and appreciate each song. A number of our readers are more used to such reflective reading with a book or kindle and the like, than plainly on a site using a blog format. Traffic: It turns out that most new readers come to this site through searching for individual songs on search engines. Thereafter, when they read more songs, they don't tend to follow the chronological order of the songs like our regular readers seem to do. This somewhat rearranges how themes are developed in this site. If you are curious about what people search for and then find this site, it is Nagumomu Ganaleni by a long margin, and then Jagadanandakaraka. We receive more comments about Nagumomu Ganaleni, Manasa Sancharare and Bantu Reeti Kolu than other songs. As for where the "readers" come from, as opposed to one-time visitors, they are indeed from all over the world, such as Ghana, Finland, Uganda, Israel and Tonga, though the bulk are from India and regions with large Indian expatriate populations, such as the US, UK and Canada. Of the poetic translations on this site, to the extent that I can comment on my own writing, I think the best is Durmarga chara as the English verses capture the mood and meaning perfectly, follow the original text well, and even stand on their own as a poem, independent of the original. Keeping this site FREE: This is by far the most important consideration. This site provides a lot of original content and in some cases original research in the commentary and lyric validation, not to mention the poetry we write for the verse translations. Yet, this site is free. The intent of keeping this site free despite the extent of original content, is to provide access to the largest number of people possible. Given the feedback and traffic, even in 2011, it appears much more useful to our readers, including students and musicians of all levels, to provide this work as a printed book. After all, this work is a book in three volumes, that is being cast into the blog format in order to disseminate it on the web. (Print being the primary focus is why we never really publicized this site anywhere on the web or in the media and none of the usual attempts to drum up traffic have ever been made. The only ways to find this site are through "blog search" or someone's referral. Like Tyagaraja himself was in his day, this site is intended to be available only for those actively seeking such treatment of these songs, and is by no means an all-purpose almanac for all.) All told, we are working on publishing the work as a whole in print. If and when it is published, we'll post a number of songs here as excerpts from the book. In the meantime we may still post songs off and on here, including songs which will not be included in the books. As always, if you have suggestions about posting or not posting new songs here, while the book is in development, you are welcome to write us a line. As always, songs specifically requested by readers will often be included on the website. Check out this page. What's in the book(s): About 155 songs are elaborately discussed with comparative commentary, as we develop the themes in Tyagaraja's oeuvre and derive his message. The songs are chosen for various merits such as lyricism and for how the message develops as described in the introductory pages here. About 18 songs from other composers are also included. Of course, all songs have lyrical translations. The remaining 500 or so songs are also validated and translated, with brief comments as needed. As they are not part of our sequential treatment of Tyagaraja's themes, these songs are included seriatim, in the second half of the book(s). In one departure from this site, a number of songs include a section called "The Listening Guide", that discusses such things as melodic detail, highlights and oddities of improvisational treatment, definitive performances and performance history. This section shall help the listener to enjoy the nuances better and shall also aid the performer seeking to add to his or her repertoire. Three essays,- on our methods, on criticism and the background for the Tyagaraja corpus make up the prefatory portion. If you represent a publishing house or other relevant organization: If you would like publish this work, feel free to write us at lyricaltyagarajablog@gmail.com. Being intent on printing the book exactly in the form we designed, (so that our new approach is all the more effective), though we are working with some reputed houses, we haven't committed to one yet and a query from a cooperative and understanding publisher is always welcome. 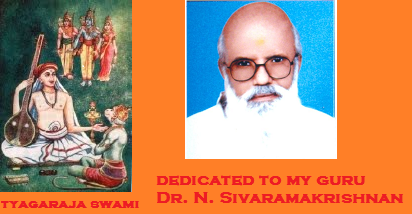 The three things we are particular about are retaining the huge size and scope of the work, as it can't be comprehensible otherwise; printing the lyrics and verse translations in our tricolor format such that the translations are easily read and a commitment to ensure that the final book is affordable so that, in the spirit of Tyagaraja, it can reach more people. Naturally, it takes a really dedicated publisher and for our part, though we have had to stay away from a couple of large houses, we are engaged with other houses. We think it is best to do it right, even if a moment later. How long has this work taken? : The answer to that is two-fold. The Vijayadasami day of 2011, marks the second anniversary of this site. But, the work behind the site, and hence the book, have been going on for many years and reach back into the early nineties. What are the priorities while developing each song? : The first and foremost task is to validate the lyrics from existing sources, and resolve any ambiguities and multiple versions with historical and musicological references. This ensures authenticity. Then comes the verse translation and the notes necessary to under the literal meaning of the song. Finally, we add the contextual notes such as from history and literature, and then weave it into our unique thematic treatment of Tyagaraja. What's the point of this work? : To summarize the introductory essays, Tyagaraja's music was primarily an honest emotional outpouring with musical detail and innovation being tools to facilitate the capture of his uppermost thoughts, much like with a lyrical poet (although a good number of songs were indeed musical experiments sometimes even with repetitive or derivative lyrical sentiment they are outweighed by the others). Despite Tyagaraja's subjects, we rigorously stay within the confines of exegesis and eschew hermenutics. In this work and site, Tyagaraja is studied and explained, but never reinterpreted, and viewed more often as poet than a composer, for Tyagaraja's poetic style is simple, direct and heartfelt and only rarely lavishly embellished. The message matters most to him, than the words it is said in, or sometimes, even the Raga scheme it is set in. So, the first benefit from our work is that verse translations like ours, convey the true meaning of his songs much quicker and apter than prose. Even today, much of the lyrical, emotional, historical, philosophical and sometimes, even musicological detail in his songs, remains a secret from even many professional performers due to the odd way Carnatic music is traditionally imparted and critically analyzed. These and other factors make the music particularly inaccessible to anyone unfamiliar with the regional culture. So, the second benefit from our work is that the extensive treatment of each song in our new method concurrently aids both these disparate groups of people, and everyone in between, in gaining a complete understanding of these songs, the history, culture, theory and so forth. Now, the performer of any level of attainment can render the song better and the listener of any level of immersement can relish the song better. At another level, understanding Tyagaraja's message in context and the wealth of background detail be it in history, literature or philosophy, is both an education and an experience in itself. Vijayadasami 2018: This site starts its TENTH Year Today! It's Our Tenth Anniversary. As ever, our thanks to all our readers round the world! More vidwans and music lovers have now taken to our site. This is our tenth year in this site, but the work it's based on is, much older. And, the Nagumomu Ganaleni song is still the main draw here...and the total site traffic is high considering it is not advertised or linked to anywhere. Why is the flavor of this site so different? : It is indeed very different from any other book or site on Tyagaraja because it is not just a paean to Tyagaraja or a mindless dictionary of all things Tyagaraja. Instead, it blends scientific precision, modern cultural theories and the art of the rigorous historian with the high art of interpreting music as finely layered as Tyagaraja's. All these elements may not be obvious at first sight, but they are all woven in, in proportion, so that the work remains accessible to all kinds of readers. It will be plainer when we get round to adding more details on the musical settings. Everyone knows Tyagaraja sang in praise of Rama. But, what's the complete picture? How does everything come together? What it did mean in his day, and does mean in our day? Such things are what we are trying to deduce. New songs and Updates, Gandhi Jayanti 2018: A new page with new songs and other updates is now up, in lieu of adding new posts here. Please use this link. As I sing of You at the town square? I ever seek refuge at Your redoubt! The queen, as before the sage, she winced? Did You not take them to Your fief? Incidents from the Mahabharata, the Ramayana and the Bhagavatam are serially referred to here. Queen ... sage: When the Pandavas were exiled to the forest, Duryodhana and his cronies bade the irascible sage Durvasa, an incarnation of Shiva, to visit them at their hermitage. The sage was known for his ready curse and ravenous appetite. Duryodhana contrived that the sage would arrive with his retinue at the hermitage after the Pandavas had had their meal of the day, and there was no food left. Durvasa was expected to run into a rage and wreak great curses upon the Pandavas. Draupadi, upon the sage's arrival, prayed to Krishna who was at the time, across the country, in Dwaraka. Krishna, with His divine powers, came to her aid and forestalled the sage. Brother fled brother's haunt: Vibheeshana, the youngest brother of Ravana, counseled him to turn over Sita to Rama and seek his refuge. In response to Ravana's anger at this counsel, Vibheeshana defected to Rama's side and was crowned the king of Lanka after the war. Prince cried out: Prahalada, though the son of an evil demon, somehow grew up to be a devotee of Vishnu and after repeated attempts on his life, by his father, the terrible Hiryanakashipu, who was protected by a boon from Brahma that made him all but immortal, was saved by Vishnu, in his most terrifying incarnation, as the Narasimha or man-lion. The incarnations of Vishnu are detailed in the Bhagavatam, where details not in the Ramayana or Mahabharata, may be found. Tyagaraja alluded to Prahalada several times, as he is a symbol of the "Bhakti marga" or the path of personal devotion, that is considered accessible to all, irrespective of birth and creed. Prahalada, though an Asura or demon, was expressly saved by Vishnu. This is in fact, the only case in Hindu mythology, when a major incarnation interceded solely to deliver an Asura. Tyagaraja, of course, composed the Prahalada Bhakti Vijayam, an entire cycle of songs about the Prahalada events. Vanaspati is one of the seventy two melakarta or foundational ragas, and one of the forty that includes vivadi swaras or dissonant notes including R3, G1, D3 and N1, in the notation scheme we use. There is some controversy between certain quarters about whether such ragas should be used in the Carnatic system or not. In reality, it reflects the development of the theory of Carnatic music over time, rather than whether these ragas can produce elaborate, consistent and pleasant melodies or not, into which debate the controversy somehow turned. The regular reader might find that the verse translations are far too frequently in couplets. This could indeed get tiresome. The sole reason for the frequency of couplets is that, while generally preserving word and sentential order in the original, I also try to match Tyagaraja's flow. Due to his particular, music composition style, Tyagaraja's lyrics, when rendered into readable English, just naturally fall into couplets. I have my own style of writing poetry, as would anyone, but it is quite clear that anyone else writing a verse translation that tries to match the flow of the original, would also use couplets. A COMPARATIVE STUDY: Here is a piece from Philip Massinger's 1624 play, The Bondman, which quite succinctly captures both the idea behind the path of Bhakti Yoga or Marga, and Prahalada's own ascent. As might be expected from a Renaissance playwright, the original thought is from Horace. But, it has been handled more directly and so, effectively, by Massinger here. The Sabaeans of Horace's time, were a people from the south of the Arabian peninsula, who had become wealthy from trading in fragrances, particularly frankincense and myrrh, which was indigenous to the area. rākā śaśi vadana! iṅka parākā? daya jūḍa rādā? mariyādā ? O Lord of the moon-like face? To forget the faithful and clemency? Deny me Your gaze and turn untoward? To we who daily prayers proffered? Hasten, hasten, raise me heavenward. Lay one You must now dote. There is not much to note in this song except that this is again in a raga in which Tyagaraja contributed a single song that we know of. In fact, no other songs in this raga are known in the common concert repertoire. But, the odd thing is that it is not a neglected or nascent raga in his time, one that Tyagaraja successfully deciphered like most of the other ragas where he contributed a single song. In fact, it is an ancient raga with more popular cognates and descendants. It was found in different parts of India and today is found both in the Northern and Southern systems. It is supposed that it takes its name from the peoples of the ancient Takka country, which the Rajatarangini by Kalhana, which chronicles the kings of Kashmir, considers to be outside ancient India and therefore possibly a northwesterly country in Persia or Central Asia, though nothing else is known about them other than this reference. Ragas named after ancient peoples are considered to have moved with them into different parts of the country. But, the Rajatarangini is from roughly around 1000 C.E., though Takka strains seem to have been known much earlier even in the remote south of India. "Earth", here, is the earth personified as Bhudevi, one of the consorts of Vishnu. It is line with Tyagaraja's specific Vedantic doctrine to hold all the world as an illusion and the Supreme Self as the only reality. As we have seen earlier, the very first verses of the Ramayana describe Rama as most compassionate and having a full moon like face indicates the compassion expected of a ruler according to Indian astrology. If I were to speculate, I would think that the Takkas referenced here, were a Turkic people who lived to the north west of the kingdom of Kashmir. It is known from the Rajatarangini that some other Turkic peoples served the kings of Kashmir. This is not a frequently heard raga or song. We shall revisit some details about the musical terms associated with different peoples later. yādava kulajāpta! sadāmoda hṛdaya! munivarya! śrīda! tyāgarāja vinuta! śrīkara! mām pālaya! As a bee finds nectar, O rector, O sage! To music, your blessed visage! The meek, by your moon-like grace. Gone be the pains that hound. This song is again reflective of Tyagaraja's Nadopasana or music as worship school of thought. Since the divine sage Narada, is considered the originator of the musical arts, he is Tyagaraja's patron saint and ideal. Tyagaraja constantly strives to emulate Narada, who attained the highest enlightenment through his music and not by tapas or penance as other sages did. Narada would also lose himself in paroxysms of joy while singing of the gods and Tyagaraja aspired for such bliss through his own music. Narada was generally venerated but not especially worshiped. He was seen as the finest devotee. Tyagaraja however, sees Narada as his savior and worships Narada, for having shown him the path of music as worship. No other composer has left behind so many songs to Narada. Although a beloved character in the Puranas and the Epics, he is not of any special veneration or adoration in daily praxis and is rarely featured along with the principal deities in temples, although he does appear in the panel art such as in the pillars or the walls surrounding the sanctum sanctorum. That Tyagaraja alludes to Narada routinely is itself a mark of his Nadopasana approach. Note that Narada is not considered the originator of music per se, as it is said to arise from the Vedas, which of course are held part of the eternal and revealed scriptures. Narada was chiefly a votary of Vishnu. If we look for parallels elsewhere, we find that Narada somewhat fulfills the role of Orpheus in showing the ascent of man through music and the role of the Muses in furthering the musical and other arts, such as inducing Valmiki to compose the very first poetry in the form of the Ramayana or bestowing Tyagaraja with long lost sacred knowledge of music, as we saw in an earlier song. Able to travel through the universe at will, he is also a frequent intercessor in both epics and in several Puranas, where his arrival always results in mischief, which however, leads to a pleasant resolution and fulfills some important purpose. A number of musical works, some verses in the Rg veda and a work of aphorisms on perfect devotion, the Bhakti sutras are all ascribed to him. Jagadisha is one of those strange adjectives. When applied to a divine being, it means, the lord of all that exists; when applied to a king, an emperor or high king and here, when applied to a sage, it signifies someone who transcends all men. Narada was born a human in some legends and rose to divinity by penance and by the power of his music and this allusion brings that to mind. Generally, he is considered a son of Brahma and a deva or celestial, by birth. The strings: the veena is considered the generating instrument of Carnatic music, and its sounds are said to arise directly from the Vedas or the Word. The Vedas were "heard" by the first sages, were eternal and were revealed. The Sama Veda in particular, the Veda that is sung and not chanted, is considered the source of music. The Gandharvas are a class of celestial beings, somewhat below the Devas in the pantheon and are associated with music and other fine arts. They are considered the court musicians of the Devas. "The pains that hound": Human distress, as meant here by the term tritaapa, is said to be of three kinds- arising due to oneself, from others and by the divine hand. Narada, constantly sings the praises of the lord and is therefore always in a state of bliss. The divine Cowherd is of course Krishna, Who was raised in stealth among cowherds, but belonged to the princely Yadava clan by birth. We can understand Tyagaraja's Nadopasana thought a little more by comparing his perspective of Narada with that of the different schools of Vishnu worship, that arose during the Bhakti, or resurgence of personal devotion movement in the North and East of India roughly during the 13th-16th centuries. These schools arose from teachers such as Vallabhacharya and Chaitanya, and can today be found in some numbers in such places as Bengal, Orissa and Mathura. They are primarily devoted to Krishna and hold "Nama Sankeertan" or singing of the lord's glory alone, as the true path that exceeds all other requirements such as the study of scripture, meditation, inquiry and observance of religious rites and duties. Naturally, they see Narada as the perfect devotee, for he is always singing the lord's praises and so, has risen to be forever close to and dear to Vishnu. To them, the Bhakti Sutra aphorisms ascribed to Narada are therefore particularly important. However, it is only his constant and rapturous "Nama Sankeertan" that they seek to emulate, and do not concern themselves with his other aspects. Tyagaraja, who sees Narada as his patron saint and guru, does agree with this view of Narada being a paragon of Bhakti. In line with his Nadopasana approach, which is more involved than the simplistic "Nama Sankeertan" approach where the simplest song suffices when offered truly, Tyagaraja additionally finds that Narada, as the greatest exponent of Nadopasana, has unlocked the mysteries of the universe through his study of music and has thus attained divine knowledge and enlightenment, in addition to being one with Vishnu. Tyagaraja seeks to emulate both, his adoration in song, and his theological attainments through the inquiry and art of music. That is why, it is of some import that Tyagaraja consistently sees Narada as a guru and a philosopher whose penance was his music, and not just as the ideal devotee. Tyagaraja also consistently sees music as containing the essence of the universe, having arisen from the primordial sound of the Onkara and the Vedas, and as having endowed the gods with their divine powers. The other schools do not venture into such involved details, as they find penance, observances, study and inquiry much less valuable than simple psalms of worship. As mentioned elsewhere, in such a system of Nadopasana, we can find some parallels with Pythagorean thought, as here too music becomes an all pervasive and potent mechanism. We may further note that while Orpheus is a far more frequent subject in the music and opera traditions of the west, than Narada, who is his counterpart in certain aspects, is, in all of Indian music save that of Tyagaraja. This song too is reflective of Tyagaraja's preferred structure to his lyrics- a premise being stated firstly, followed by a restatement and a bhashya or an exegesis like development of the premise in the charanas. We can also note yet again, how different Tyagaraja sounds in his Sanskrit songs compared to his Telugu songs. He is clearly more studied. There is again not as much reflective detail and emotional fervor and the lyricism here borders almost on the impersonal, that we cannot uniquely tie this song to Tyagaraja based on its words alone, as we could a number of his other songs like nagumomu kanaleni or sri narada muni, where he clearly indicates a personal experience and possibly even an immediate experience that is reflected in song with spontaneity. Beyond this, some commentators tend to draw the line that Tyagaraja's diction in his singleton songs was intentionally simpler, as he considered them to be pedagogical, whereas his musical plays were more stylish as they were considered higher performance art. I am yet to be convinced about major distinctions. In many cases, we could extend the generalization on language even to the underlying musical structure. The adventurer and innovator more frequently, though not necessarily, rings through in the Telugu songs. When we get down to the tiny business of musical detail in some time to come, we shall study these variations also. Some concepts mentioned above, have already been encountered in other songs. They are repeated here for the sake of completeness, as I prefer each song be self-contained and allow easy reading. Most authors will render Jagadisha as lord of the world or of the universe. This also happens when music scholars translate Tyagaraja's songs and all the main books including TKG's do that. The justification given when a being lesser than Vishnu or Shiva or the Brahman is so addressed, is that the lesser being is seen as a part of the Supreme Being, pars pro toto, unlike other unenlightened beings and hence worthy of such appellation. However, it is easier and more fitting to simply consider that the meaning of Jagadisha can vary by context. Here for example, we know that Tyagaraja sees Narada as a patron saint, guru and savior and not as Rama Himself. Therefore, the meaning I have read, follows. The other possibility that looms, is that the text might have elided over time, absent a contemporaneous printing and it may not have read Jagadisha at all. Alternate meanings can be derived for Jagadisha other than these common meanings. But, we know from his body of work, that Tyagaraja's technique and inventiveness lie elsewhere and that he was not given to word play or summoning up obscurities. We can even surmise that Tyagaraja turned hyperbolic, as poets often do and recall that he is not considered the most precise of the Trinity. Why am I splitting hairs on such a small point? Only to illustrate how we are often working with double blindfolds without a contemporaneous printing and how we may tackle such questions. Internal consistency is the main tool that helps us. I tend to use exclamation marks to delineate the different epithets with which the composer addresses the subject, generally Rama and in this case, Narada. This is a convention used in Prof. T. K. Govinda Rao's book, as well as some prior works. It is one of the few prevalent conventions retained here. Technically, one could argue that it is not really a clean practice for Indian languages, as these norms of punctuation are based on western scripts and methods. In our case, it is useful to adopt, because we focus so much on lyricism and expression. nē bhēdamā? idi mōdamā? rāma! inta hēyamā? muni gēyama rāma! In prayer my hands lock. So you lavish upon your flock. Must we in argument lock? "We aren't one", do you mock? Will this charade amuse You? Is saving me a burden? All my trust I duly kept. Bound am I to Your feet. Is it at all fair? Or a gainful affair? Such ill will? In You of sages' trill? Hasten to my side, Most kind! Ever in my heart and mind! This song is another from the Prahalada Bhakti Vijayam cycle. Its simple structure, rhyme and metrical symmetry make it suitable for group singing in a call-response form as well as normal rendition by a single performer. The fastidious may note a mythological anachronism in this song. As it is from the Prahalada cycle, we can surmise that it appears to Tyagaraja that Prahalada prays thus to Rama. However, in commonly held mythology, Prahalada figured in the fourth incarnation of Vishnu, that of Nrsimha or the Man-Lion. Rama was the seventh incarnation and was born ages after Prahalada's time. Even the line of the Raghus had not yet been founded. This song too, thus shows Tyagaraja's propensity for Ishta Devata Aradhana, or worship of a personal deity, a concept discussed elsewhere. This concept makes the seeming anachronism consistent, for we next encounter the reference to Wealth being His consort, rendering this as a case of pars pro toto. In my opinion, Shahana is one of the gems of the Carnatic system. It is not easily imparted and needs some maturity for an exposition, but it can convey extraordinary emotional content. There is a tradition in many parts that this raga must not be taught by a teacher lest the tutelage would break prematurely. It is often postponed to the end of the training period. As can be concluded from its complex ascent and descent schema, it may not be easy to compose such simple lyrics and music for it as in this song without oversimplification. From personal experience too, I think it can sometimes be hard to compose in it. Compare this with the song emaanticchevo, which we shall soon cover. That is a more mature work in terms of sustention of phrases, shows the complex layers of Shahana more and contains rich emotional expression. Knowing the context of the Ramayana is essential to understanding Tyagaraja and thence, Indian culture and its place in world culture. In the Ramayana, Rama was described as the ideal man. The Ramayana begins with Valmiki, the poet, asking the celestial sage Narada who was the best of men. Narada replies that it was Rama and then details Rama's life to him. Rama was most just, virtuous, heroic, wise, strong and exceedingly handsome. Rama and his brothers were together, an incarnation of Vishnu, with Rama claiming half the divinity. Rama as depicted in the Ramayana: We concern ourselves with poetry a lot at this site. The Ramayana, called the "Adi Kavya" or the Original Poem, was the first work of poetry in Sanskrit and the oldest epic poetry extant today. The parallels with the first classical epic of the west, the Iliad, are obvious. The Ramayana which does seem to be the older, is much more complete as a work in plot and detail. It also contains far more science, history, ethics, philosophy and theology, as the poet does not merely chronicle, but also develops his subject. Such observations of course fall within such realm as we find when we torture comparison between the two works, as there are great differences too. In the Iliad, Helen eloped. Sita was abducted and remained the paragon of virtue as she spurned Ravana continuously. The Illiad chiefly celebrates valor. The Ramayana on the other hand is much more profound. It does not celebrate any one exploit or attributes. Instead, it celebrates the ideal of Man. In fact, it begins with the poet Valmiki musing about who was the ideal man, who was worthy of his poetic labors. And the omniscient sage Narada appears before him and describes Rama's many virtues. This was the ideal man. Here are the verses from the Ramayana where Narada first introduces Rama to Valmiki. These verses describe Rama's attributes and virtues in full. "Who in this world now, is goodly, valorous, righteous, thankful and truthful and has fixity of purpose? Who is of sound character and the benefactor of all beings? Who is wise and capable and whose kindness makes him a pleasant sight to all? Who is assured, calm and radiant and has no envy? Whose wrath do even the gods fear in war?" "Many are the virtues you speak of, O sage! Listen, as I describe to you a man of such qualities. He arose in the line of Ikshvaaku and he is called Rama. He is disciplined and has great courage. He is radiant and resolute and also has temperance. Intelligent, just, articulate and auspicious, he is the queller of foes. He has broad shoulders, big arms, a conch like stout neck marked by three lines and high cheek bones. Barrel-chested, a great archer and muscular, he destroys foes. He has long arms dipping to his knees, a well proportioned head and a wide forehead and is quick of step. Of good proportions and similar limbs, lustrous and valorous, stout chested, wide eyed and handsome,- such are his auspicious features. Discerning of righteousness, truthful, seized of his subjects' welfare, famous and learned, he is immaculate and focused. He protects all beings and the world and is the guardian of righteousness. He is versed in the principles of the Veda and the Vedic auxiliaries and in science of archery. He knows the purport and essence of all scriptures. He knows tradition and laws and acts in accordance with them. He is loved in all the worlds, gentle, high minded and discriminating. Ever approachable to the pious as the ocean is to rivers, the honorable one treats all equally and is ever a fond sight to all. Kaushalya's joy is so endowed will all virtues. He is as deep as the ocean and as firm and steady as the Himalayas. Like Vishnu in bravery, and charming like the moon, he is like the apocalyptic fire in anger and in patience, equal to the earth. In giving, he is like Kubera, the lord of wealth and unsurpassed in being true like Dharma, the lord of righteousness and death. Such are the virtues of Rama, the truly valorous." Here is something in great contrast to other incarnations of Vishnu and other gods as described elsewhere. Narada describes a man of superlative qualities, but a man nonetheless. Nowhere does he say that Rama was a god and so wrought miracles or that Rama claimed any divinity for Himself. Rama is described as the ideal man throughout the book who wrought miracles by virtue and by perspiration. We are told elsewhere that Rama and His brothers were indeed incarnations and shared divinity among them. But, we are also clearly told that Rama even if divine, never exercised nor claimed any divine powers and lived and perspired as an ordinary mortal. That is, Rama was a model for men to aspire to, far more than being a deity to worship. Rama represents the ascent of ordinary man to divinity through virtue and merit. Such is what we gather from the Ramayana. It is possible to view the attributes mentioned here, as being those of the Supreme Self. This is how several commentators view it, finding an inner meaning to these verses. However, I have, in conformity with the theme of the "ideal Man" in the original text, alluded to them as humanly virtues. For an interesting comparison, here is R.T.H. Griffith's rendition of the same verses from the late 19th century, when the world was a very different place and western sensibilities to the east, were nascent and sometimes ill-founded. Much study of the east and of Hinduism, Buddhism and such subjects took place, though often, not with the noblest intent. Yet, even over a hundred years later, for better or worse, Griffith, Max Mueller and other translators of their times have stood on in the west. Griffith who also wrote the first Rg and Sama Veda translations for the West, chose to write a verse translation of the Ramayana. While this was an admirable objective and his scholarship in the classical languages of the West and the East, and English, was vast, personally, I find novelty but not the poet's mark in these verses. I find the job adequate but not very highly competent. Are graces found so high and rare? In whom alone these virtues dwell. His threat displays the auspicious sign. The manliest form e'er fashioned yet. On erring sense a watch he sets. Has trained him to subdue his will. The cause of justice to maintain. The Vedas and their kindred lore. So liberal, so just is he. And Justice self in a human mould. I write all translations from the Sanskrit or Telugu originals afresh for this site. Neither R.T.H. Griffith, nor anyone else are sources for the translations presented anywhere in this site, unless explicitly mentioned as such. The Griffith translation here is a free translation and is not literal or word-for-word. Also, I favor a "from the source" approach in order to be close to the original. I seldom touch commentaries, even ancient ones, to present the subjects here, unless it is necessary. On occasion, the reader might find I deviate from common readings slightly. This will generally be because, I have, in my opinion, tried to remain as close to the original as possible. In order to develop the themes and rationale of Tyagaraja further by touching upon the virtues of Rama, I have continued the commentary of the last song, than belabor a new one. This note on Rama pertains to all the songs on this site and helps to understand how Tyagaraja saw Rama in his mental image. Your servant's grandfather left behind in manuscript, his very fine translation of the Ramayana. This remains as yet unpublished, mainly because I haven't gotten around to redacting it. He was my first Sanskrit teacher and though I was only a few years old at his passing, he remains an inspiration to me. The least one can do, is befit one's legacy and not belie it. On anonymity: I had comment that I had not named my grandfather above and any wish to preserve my privacy may not be offset by including just his name in tribute. This is true to a degree. However, as some readers who have corresponded with me know, I have retained anonymity here only because I am not yet sure of the final form the matter here- as book, newsprint, audiovisual or new media or just this website. I am also not sure if and when I will complete this venture as it is planned to run to over 3000 pages and cover not just Tyagaraja but music, Indian culture and Comparative Literature to the extent possible and meaningful, as suited for the modern reader,- a key consideration being that much literature written on these topics including Tyagaraja is either antiquated by now, or presumes a well informed and invested reader of a certain background or both, whereas my approach here makes no such assumptions of the reader. It is accessible to the modern reader of both kinds- those new to these subjects and to those well versed in it. Our purpose here, is not to just provide a compendium of all Tyagaraja songs or a selection. As the final form and extent are still unknown, I am also not actively promoting this website at various print and online forums. However, it has little to do with privacy and more to do with completeness. I do identify myself as needed, in correspondence I receive on this site. When the final form and extent of the content here is known, I will of course publicize as necessary, this website and any accompanying books or the like and affix my name to the whole as being the party responsible for all its shortcomings. I will at such time, identify my ancestor as well as those readers and fellow scholars and students of these subjects, who provided suggestions and insightful comments and the one or two who provided reference or other resources to aid in this work. Until such a time comes to pass, I don't think it is necessary to "name names". An aside: This now comes to mind. Nirad C. Chaudhri, in his Continent of Circe, made the unfounded and hilarious suggestion, albeit in all seriousness, that Rama was a Persian prince and the siege of Ramayana happened on an island in ancient Persia. How the sagely heart swelled. All limits His charms did elide. And so, the sage winked "Now!" Lo! He'd rent the Great Bow! This song about Rama's valor and beauty is a fine example of Tyagaraja's poetry. He visualizes the scenes of Rama's conquering pestilential demons and breaking the great bow under Vishvamitra's tutelage. Through the eyes of the sage, he marvels at the beauty of Rama which shone through even whilst performing such exploits. Throughout the common concert repertoire, we seldom encounter the vivid images and emotional expression of Tyagaraja's songs. This sets him apart as the artist among composers. Then comes the fine musical detail. Tyagaraja's songs, like this one, belong as much to the musician as to the poet. If you hear this song sung softly, you will see how both the cadence of the lyrics, and the musical scheme, imitate the gentle tossing of forelocks in the wind. It takes extreme skill to concurrently create such music and poetry- simple, yet graceful. No commercial interruptions: Tyagaraja gave of his music freely. And so, this site will always remain ad free. A user guide and details about our unique approach are provided here. Also see the intro section below. This work is comprehensive at over 3000 pages. This online preview is about 250 print pages long. We hope you may see that Tyagaraja can be just as beautiful in English too! And his message, just as sublime! Here are examples on how to pronounce the modified alphabets. This is based on IAST. Each alphabet corresponds to the boldfaced and underlined letters in the sample word. There are some other special cases not covered here. These are mentioned in the remarks of the relevant kritis. (Eg)In a Sanskrit kriti, o is always a long o as in goal. In a Telugu or Tamil kriti, a long o is indicated by ō, but just an o indicates only a short vowel sound as in port. That is, Sanskrit kritis are in IAST. Other kritis are in ISO 15919. Parts of this guide are revised and adapted from RK Math and MB publications. Requests, Comments, Suggestions: email: lyricaltyagarajablog@gmail.com We love to hear from you.